Tourist Lodge, Hollong – It has only very limited capacity but it is at the core of the forest. It is 7 km from Madarihat. No. of rooms: (7) Seven Double Bedded rooms @ Rs.1000/- per room per day + Compulsory food @ Rs.175/- per head per day (dinner, breakfast & bed tea only). Lunch – Optional Rs.75/- per head. Jaldapara Tourist Lodge, PO Madarihat, Dist. 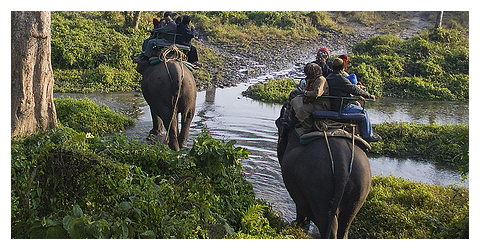 Jalpaiguri PIN 735 220 – It much bigger than Hollong tourist lodge and has dormitories too. Direct booking at Tourist Lodge, Telefax +91 3563 262230, +91 3563 262606. Rates Rs. 1,000 (non AC double bed), Rs. 300 (dormitory – 5 bedded), Rs. 650 (double-bedded Tourist Hut). Malangi Nature Resort at Baradabari (West Bengal Forest Development Corporation), on the other side of the sanctuary. Chilapata Jungle Camp – a new outfit near Chilapata Wildlife Sanctuary, run by Help Tourism. For bookings contact: info@helptourism.com. From Siliguri – West Bengal Tourism, M-4 Building, Hill Cart Road, Siliguri, Telephone +91 353 2511974, +91 353 2516306.